Izmir is one of the most interesting cities of Turkey in all aspects and the city has so many advantages in all points. Due to its strategic location as if it is a gateweay between east and west so it still grabs the people to settle down for job opportunities and has become the third largest city in population. It has a natural bay available for exporting agricultural products grown in Aegean region such as sultana raisins, tobacco and cotton and importing crude oil from oil producing countries. It also hosts so many ancient civilizations such as Pergamum, Smyrna and Ephesus so millions of foreigners from all over the world pay a visit either by planes or cruise ships to see ancient beauties in and around. 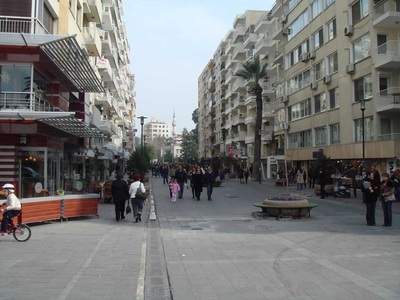 Izmir has cospomolitian population which makes easier to live in tolerance for different congregations and cultures. Anyone can go to the moqgues, churches and synagogues to pray without any condemnation and the inhabitants of Izmir are very proud of keeping these temples side by side representing Islam, Christianity and Judaism. Izmir is the center of the culture, science, research and study for higher education therefore there are eleven universities, colleges, research institutes and medical hospitals. The city aims being one of world’s the well-known and the best medical centers shortly after. 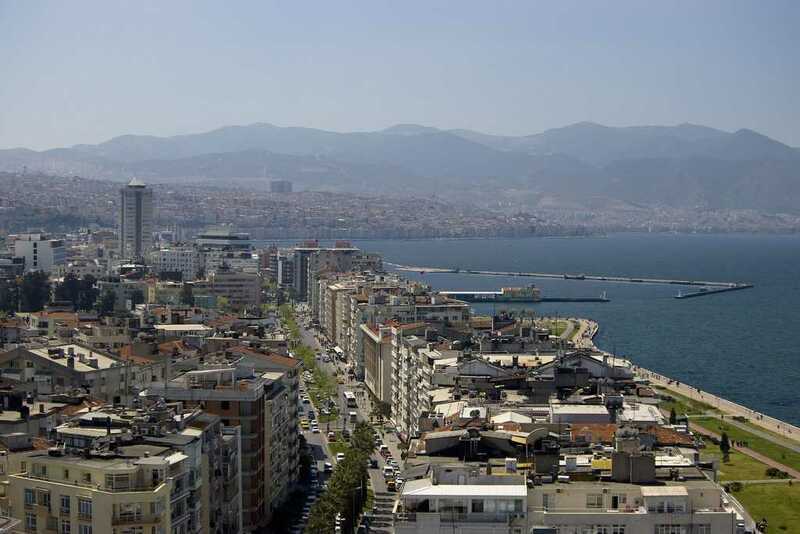 The foreigners have been keen on making investments in recenet years in Izmir. The trade mark of Izmir is the first international fair of Turkey and a great candidate for Expo center in the future. Want to travel to Izmir within your budget? 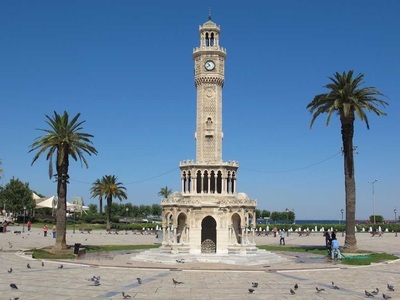 Check out Tour Maker Turkey’s vast range of Izmir travel packages to make that trip to Izmir possible. Besides Izmir tours, our website features key information on Izmir’s sightseeing points, historical attractions, attractive hotels, activities, food, climate, maps, and much more! Click here to learn more. Izmir, in the middle of Aegean region of Anatolian peninsula located around the natural bay of İzmir , is a port city. There are the Greek islands in the west and Kusadasi is 90 kms in the south, 110 kms to the Balıkesir in thee north and just 40kms to Manisa in the east. Air, Sea and Road connections from all over Turkey makeit easy transport to Izmir. The third biggest airport is 25 kms far way in which has so many direct flights from all over the world and the port of Izmir is one of the favourite cruise ports of east Mediterrenean Cruise liners. The ancient name is Smyrna, one of the most important cities of Ionian Federation during Hellenistic period, and it carried the same name in Roman times. 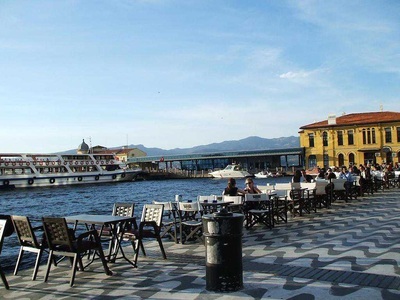 The city is called Izmir after World War I so it has two different names ; Smyrna ancient one and Izmir at present. 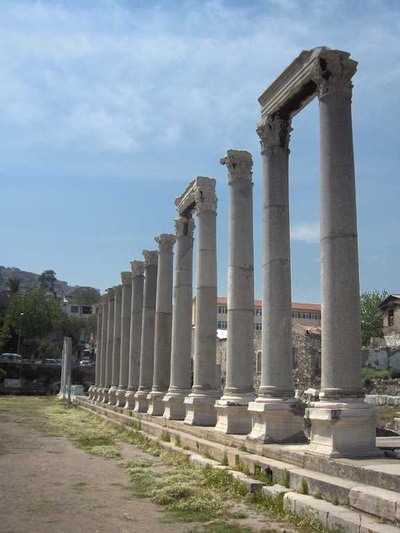 The history of Izmir goes back around 8500 BC and it is believed that Smyrna has been founded by Amazons. The first establishment was made in Bayraklı, old Tepekule, location just about 3 miles from down town. The city was ruled by Hittites in between 2000-1200 BC and then captured by Aeolians. About 800 BC the city became one of the Ionian cities of twelve. In 600 BC Lydians, under the commender of king Coresos, took over the city but Persians from Iran took over the city in 546 BC and the dark age began. In the beginning of the Persian rule twelve Ionian cities wanted to make a union to defeat the invaders called Ionian Federation in the history, a primitive sample of the united nations, but it did not work so the Persian rule lasted about three hundred years. In 334 BC that was the end of the Persian period because of the Alexander’s arrival. Alexander the Great crossed the Dardenel, drove the Persians away and saved the all Ionians cities one by one. During his stay in Asia Minor, Alexander spent some days in Smyrna and according to one legend, he spent a night around mount Pagos and in his dream he was advised to refound the city around the bay of Izmir. The following morning he receommeded to his generals to change the location of Smyrna to move around the bay of Izmir in future. Alexander’s advice was done by one of his generals Lysimachos in 300 BC and the city was taken to the around the bay of Izmir as a port city. After Lysimachos the city was added to Pergamene Kingdom and later it was gifted to Rome without war by the last king Attolos III in 133 BC. Between the 1st and 2nd C AD, Smyrna was the second important city in the Roman province of Asia after Ephesus with the population about 200,000. Ephesus and Smryna were two ports of export and import facilities in Roman world during the time of Pax Romana, Roman Peace. This glory was ended at the end of the 5th C AD and Smyrna became a small Byzantine town in 6th AD. Smyrna was sieged by several nations and troops in between 7th and 8th AD, Umayyads, Abbasids, Sasanids and Turks captured Smryna in 1095 but a year after Byzantine troops retook over the city and it lasted until 1317 when Aydınoglu Umur Bey conquered the city so it fell into Turkish hands. Later Crusaders made a great damage for about a century and Smyna became an Ottoman town in 1426. The first European merchants were Venetians in 1530 and later British and Dutch business people began making trade with Ottomans. In 17th and 18th centuries Smyna has become a cosmopolitan city with foreign settlers. After 1850 thousands of Turkish immigrants from Aegean islands and Greece were forced to be settle down to Smyrna. During World War I, Smyrna was invaded by Greek troops in 1919 whom they made a great damage and the city was saved by Turkish troops in 1922 under the commander of Atatürk. While the Greek troops being towed in 1922, they put Smryna in fire and two third of the whole city was burned out. The city was refounded once again with a new name; Izmir. Three major religions of the world ; Islam, Christianity and Judaism can be practised freely by its believers in İzmir so this city has been known as the city of tolerance for centuries. First Turks came and captured the city in 14th C AD, then in 1492 , the Jewish immigrants from Spain as Seferads were permitted to settle down as citizens by Ottoman authorities and finally the Europeans came in 17th and 18th centuries to make trade so the demographic situation began changing. The population is now about four million, majority are Turkish, but we have Jewish and Christian minorities. All of the mosques, churches and Synangogues are open to pray. Here and exported to the whole world as making the great contribution for local economy. Smryna was the second church of Revelation in the time of St.John the Evangelist whom he paid a visit and gave a letter to the church elders as the warning of God. The church of Smryna is known poor church and Polycarp, one of the early believers of Jesus, was martyred in this city so the church was condemned by Jesus and advised to be faithful event in the point of death. It is about 5-6kms sea front-coastline- beginning from Konak Pier to Alsancak train station that is called as Kordon by the inhabitants of Izmir. A large and long avanue chirping for poems and songs is always alive at all hours of the day. Walking hands in hands as lovers, sitting in a street cafe shop and drinking famous Turkish coffee, listening to live music from taverns and pubs, feeding the pigeons taking off or landing on, playing a musical instruments to give a concert to the passers-by or laying down on the grass and watching the sky can be one of your choices if you have any spare time. Velvet castle was built in 3rd C BC by one of the generals of Alexander the great in the center of dominating the gulf of Izmir. The castle bears Roman, Byzantines and Ottoman remains and it was used as a fort for defense. It is about 185m above the sea level and it covers six square kilometres. The northern and eastern walls of the castle have been completely destroyed in which western and southern walls with five towers are still standing. The height of the towers in between 20-35 metres. Today there are the ruins of Byzantine arches, a mosque and a large cistern inside the castle. Kemeraltı Mall is the most vibrant shopping center of Izmir for centuries covering a huge area ranging from Mezarlıkbasi district to Konak Square. When it was built first in Ottoman period, it used to have big grand bazaar with vaults so it is called as Kemeraltı in Turkish. Traditional stores along the narrow streets, modern business çenters in large squares, herbalists, spice shops selling safran and cinnemon, cinemas and cafes offers visitors so many different opportunities not only doing shopping but also relaxing for a while. It is possible to purchase every kind of products in this mall from traditional Turkish handcrafts such as rugs and kelims to ceramic and wooden souveniers. 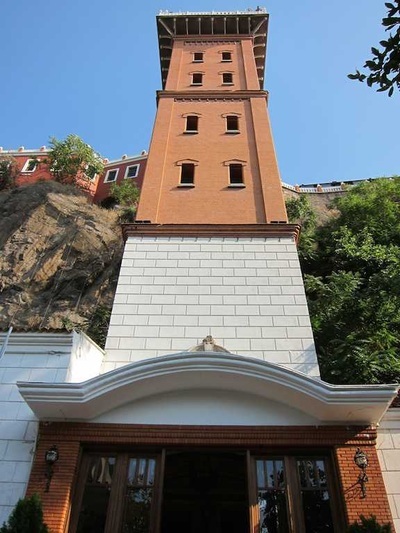 Due to the difference in elevation between the two streets, an elevator was built by Matt Levi, a Jewish businessman in 1907, with the aim to facilitate access the road easily. Previously, people living here were forced to climb 155 steps to Access to their houses so the lift, calledAsansör by Turkish people, made the life easir for inhabitants of the two districts. There is big tower with two lifts, While the left one worked with steam engine, the other by electiricity. In 1985 two lifts were renewed and adopted to the electric system. It has been one of the famous and nostalgic stop for visitors. When you reach to the top by lifts, you will have a splendid view of gulf of Izmir. Agora or Forum was the market place in ancinet times in the sense of political meeting place and shopping area. The agora in Izmir was used as a state agora for politics. Great columns, porticos-collonnaded walkways for shoppers or listeneres, stores with rounded arches and statues of Demeter and Poseidon make a great impact on visitors reminding the Roman times. The site is still under the excavations and all the findings fro Agora are on display at Izmir archeological museum.